It's the winter sales again and like every year there are many interesting windows to photograph. I found this one at Conforama (a department store dedicated to house equipment), on the river banks, near the Pont neuf and quite liked it. Of course, this year, due to our economical problems, I doubt the sales will be very successful, but it won't prevent me from photographing them - at least this is free! It brings to mind a show on Housewares at the Philbrook Museum of Art in Tulsa, Oklahoma. One of the pieces is an bright green glass iron. http://designapplause.com/wp-content/xG58hlz9/2010/11/kravis3-14b.png Most of the housewares in the show are from the 1930's to 1950's. It's the invasion of the clothes irons! This intrepid defender, who oddly tried to conquer them with a vacuum cleaner, seems to be on the run. At least he's dressed for his funeral. I recall that the archetypal housewife of the 1950s-60s would wear a housedress, faux pearls, and high heels while doing the housework. This gentleman is similarly well dressed. Love the colours. I think it's a creative way to show something very boring. Jeff, thanks for identifying those unidentified flying objects. Now at last I know what an iron looks like. The other item is...... a VACUUM CLEANER? Did I get that right? Looks like everyone's gone to the sales today. Oh well, if you can't beat 'em, join 'em. Make One Get One Free! Don't miss out on this never to be repeated* offer! *The management reserves the right to repeat such offers on any future date. Furthermore, the management accepts no responsibility whatsoever for the quality, sanity or lack of humour of any sale comment. All comments read as seen, no refunds on sale comments. All commenters must be over the mental age of 3 years, have an unhealthy interest in all things Parisian and swear allegiance to the the Glorious Ruler Eric King Sun-il. I wish I was there to do some serious shopping! LOL, Drummond. I'm not over the mental age of three (today at least), so I only get one comment. 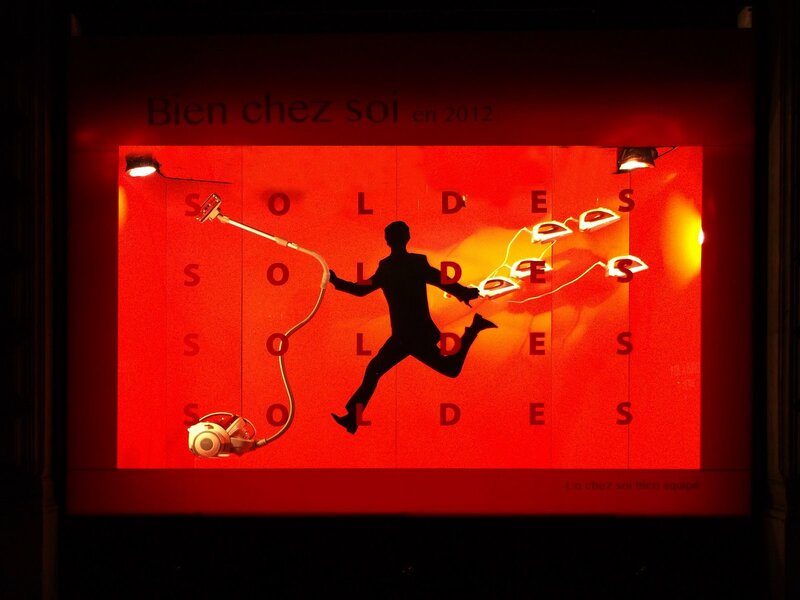 Do you suppose the message of the vitrine is that you can really clean up at this sale? Forget it -- I'm taking it anyway. Paris rules—and so does Eric! how I feel most days about housework. Very interesting window about a most uninteresting subject.